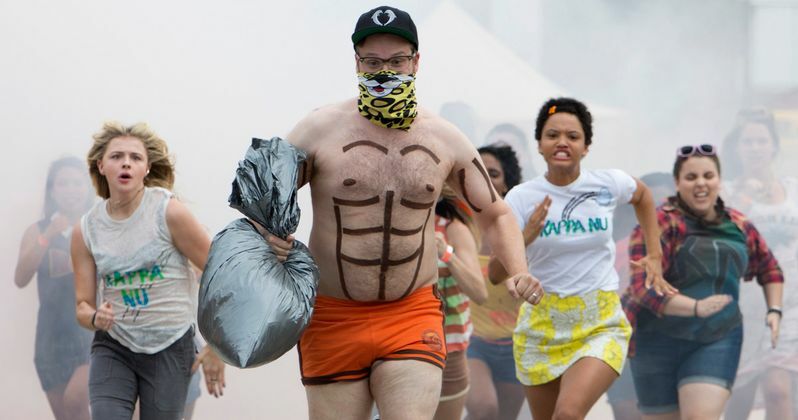 Universal Pictures' raucous comedy Neighbors was one of the biggest surprise hits of 2014, taking in $150 million domestically and $270 million worldwide, from just an $18 million budget. This summer, Mac (Seth Rogen) and Kelly Radner (Rose Byrne) will have a new group of rowdy neighbors to contend with in the highly-anticipated sequel Neighbors 2: Sorority Rising, hitting theaters on May 20. Universal Pictures has released the first trailer, following the bizarre first look photo released back in December, which gives us our first look at sorority leader Shelby, played by Chloe Moretz. Now that Mac (Seth Rogen) and Kelly Radner (Rose Byrne) have a second baby on the way, they are ready to make the final move into adulthood: the suburbs. But just as they thought they'd reclaimed the neighborhood and were safe to sell, they learn that the new occupants next door are a sorority even more out of control than Teddy (Zac Efron) and his brothers ever dreamed of being. Tired of their school's sexist, restrictive system, the unorthodox ladies of Kappa Nu have decided to start a house where they can do whatever the hell they want. When Shelby (Chloe Moretz) and her sisters, Beth (Kiersey Clemons) and Nora (Beanie Feldstein), find the perfect place just off campus, they won't let the fact that it's located on a quiet street stand in their way of parties as epic as the guys throw. Forced to turn to the one ex-neighbor with the skills to bring down the new Greeks next door, the Radners-alongside best friends Jimmy (Ike Barinholtz) and Paula (Carla Gallo)-bring in charismatic Teddy as their secret weapon. If he can infiltrate the sorority and charm his way through it, the thirtysomethings will shutter the Kappas' home. But if they think that their neighbors are going down without a fight, they have severely underestimated the power of youthful ingenuity and straight-up crazy. Nick Stoller again directs this comedy that follows what happens when the will of parenthood goes against the bonds of sisterhood. Selena Gomez also stars as the leader of a rival sorority. Seth Rogen also serves as a producer and he co-wrote the script with writing partner Evan Goldberg, director Nick Stoller and original Neighbors writers Andrew J. Cohen and Brendan O'Brien. Neighbors 2: Sorority Rising is set for release on May 20, going up Sony's The Angry Birds Movie and Warner Bros.' The Nice Guys. In addition to the first domestic trailer, we also have the new international trailer that you can check out below, along with the new poster. Are you looking forward to this beloved married couple going to war with an outrageous sorority? Chime in with your thoughts, after taking a look at the first footage.